Last fall, Fox News celebrated its 15th anniversary with a lavish party in New York. 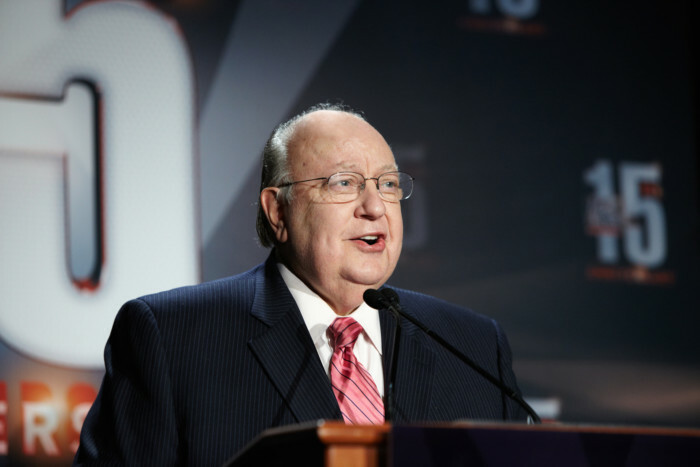 Fox News president Roger Ailes, who launched the channel in 1996, toasted 700 or so staffers that night, telling them, "Losing is highly overrated as a learning experience." On Tuesday afternoon, when Nielsen releases its final ratings for the month of January, the "fair and balanced" network will mark an arguably more important milestone: 10 consecutive years at the top of the cable news rankings. Yahoo News recently spoke will Bill Shine, Fox News Channel's EVP of programming, about the significance of the achievement, the state of cable news, and how the cable network has managed to sustain its pole position while defending Fox from its fervent critics, including Jon Stewart. Yahoo News: So, are you going to frame the Nielsen report? Shine: No, no. We don't do a lot of that around here. We may pat each other on the back, but the news goes on. We'll keep it rolling. What's been the key to maintaining your no. 1 position in cable news? A couple of things. Roger's leadership. He had the idea, he launched the network, he hired the talent. So it's been Roger, Roger's vision. Over the years we've gained the trust of the American people. And Roger picked good people, not just on-air, but the producers and everyone behind the scenes who have contributed to our success. What would you say is the best strategic move the network has made over the last 10 years? I don't know if I could single out one thing. What happened was—keep in mind, over the course of those 10 years, a lot of news has happened. You had an impeachment, the 2000 election, Bush-Gore, of course 9/11, Iraq, Afghanistan, the Middle East, hurricanes, Katrina, the D.C. sniper, natural disasters, politics. So there's been a lot of news. Then, what you had happen was, those viewers who came in for the big story stayed to sample our programming. More and more of those people stayed. At the same time, we had a lot of people talking about us, on talk radio and in the news media, the media press, talking about what we do. So it was also about us getting recognized for what we were doing. Worst move/biggest mistake? There has to be one. Hmm. That's a great question. [Pause.] I'm not dodging you, but I'd have to think about it. Ask me some other questions and I'll think about it. Everybody makes mistakes. You spend your whole day trying to avoid them, and then own up to them when you do make them. Just to be clear, I'm not talking about an on-air mistake. I'm talking strategically. Yeah, not like [the time] we spelled Obama's name wrong. Well, here's something: Very, very early on, it did take a couple of years to figure out who we were. We used to have this segment called "Fox On" where it would be 10 or 15 or 20 minute blocks of "Fox On Sports," or "Fox On Art." And then we'd have to interrupt "Fox On Art" to carry a White House briefing. Hindsight being 20/20, that was a pretty bad idea. Then, of course, Bill O'Reilly. When we first hired Bill, he was on at 6. It was a few years before Roger said, you know, we should put this guy on at 8, in primetime. What do you look for when you are courting on-air talent? The main thing you want to know if they are smart, if they're entertaining, if they're intelligent, if they have a natural curiosity about the world. If that comes through in an interview, then it should come through on television. Roger always tells us, "Watch TV with the sound down. If you have the urge to turn the sound up, to hear what they're saying, that's someone you want to hire." According to a recent poll, Fox News is the most-trusted name news network. But according to the same poll, it's also the least-trusted. When you see polls like that, what is your reaction? You obviously have a core of people who trust you, and a core of people who don't. How do you approach the people who don't trust you? You don't know me, but I'm not a cocky guy. And I don't want this to sound cocky, but I don't pay too much attention to them... I think the people who don't trust us, some of them watch and just don't trust us. But some may see something written about us on the Internet and latch onto it. What I find is that they don't trust us, but have never watched us. I think if people just spent a little time watching us, they'd have a different opinion. But to be honest I don't think much about them. I spend a lot of time thinking about improving what's on the screen. Fox News is no. 1, but with that comes plenty of critics, especially when it comes to worldview. When Jon Stewart was a guest on your network, with Bill O'Reilly on "The Factor," he argued that "there is a selective outrage machine here at Fox that pettifogs only when the narrative suits them." What is your reaction to that? A couple things. Stewart is not a writer. He's a comedian. He has a lot of writers who write for him. And they come up with some great lines. So I'm not even sure he came up with that himself, but let's just say he did. It's his opinion, he can say whatever he wants. If you look at our lineup, our stable of talent, it's the most [ideologically] diverse of anyone on cable. Starting with our news journalists, to our primetime programming. Watch Bill O'Reilly tonight. His Talking Points Memo, which I just read, is very balanced. Then watch Hannity, who is our conservative. Make no mistake, we pay him to be our conservative. Then watch Greta at 10. If you take that lineup, and add our news journalists during the afternoon, it's the most balanced out there. You get all sorts of opinions. You look at other networks, that doesn't happen. What about the criticism that Fox is a farm team for the GOP? A place where people like Sarah Palin and Mike Huckabee can go after their campaigns are over? I actually think it's a bit of jealousy. [The candidates] get calls from the other networks, asking them to come work for them. The two you mentioned, they got calls from other networks. The other networks tried to hire them. But they decided to come work here. We're happy about it. But doesn't hiring ex-Republican candidates make it harder for you to back up the "fair and balanced" mantra? No, not at all. Look, we hired [former Democratic Sen.] Evan Bayh within the last year. If you look at our whole lineup, we have [FNC analyst and former campaign manager for Walter Mondale] Bob Beckel, [Democratic strategist and Fox News political analyst] Doug Schoen, people like that. It's very balanced. The perception is that CNN is great when there's breaking news, and Fox is great at opinion coverage. Does that stigma concern you at all? Sure. Look, the culture around here isn't, "We're no. 1, everything is great, let's take it easy, everybody take a three-day weekend." We're always looking to improve our breaking news programming. There are viewers who will always turn to CNN instinctively if there's a big or breaking news story. The question is, how do they keep them coming back? It seems like they've had a hard time doing that. It's been a struggle. Do you watch CNN? Do you watch their debates? Of course, of course. I have six TVs in my office. Everybody watches everybody else. You want to know what your competition is up to. What are the TVs in your office tuned to? Fox News Channel. Fox Business. CNN. MSNBC. The local Fox-5 affiliate in New York. And—don't tell anyone this—the Golf Channel.